Alias Mae has come to knock your socks off! 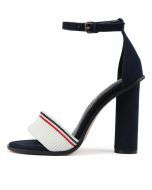 A sporty take on a classic sandal, this design is crafted from soft leather and has a fabric toe strap with athletic stripe detailing. The ultimate athleisure option, this shoe will look runway-ready paired with slim-fitting sweatpants and a cute crop.